Had a tough day at work? Need to take out your frustrations on something? Well, take it out on the UFC MMA Training Bag. 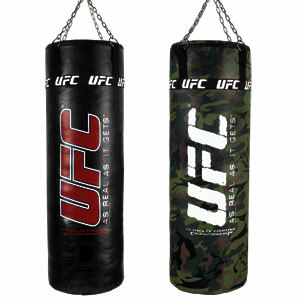 You don’t need to be a cage fighter or train in MMA (mixed martial arts) to unload on this heavy bag. Punch, kick, knee, and elbow away on this 100 pound bag. It has 260 square inches of striking surface and will stand up to the toughest blows. So go pound away, but don’t forget the gloves.